I'm suspicious. Who is behind this sudden rash of slapstick attacks on conservative pundits? First William Kristol, editor of the conservative Weekly Standard, was hit in the face with a pie while speaking at Earlham College, a private Quaker college in Richmond, Ind. 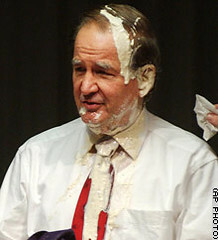 Now right-wing pundit and former CNN Crossfire host Pat Buchanan gets doused with salad dressing during a speech at Western Michigan University. These kinds of stunts always make the attackers look like idiots and build sympathy for their intended targets. Are there really a bunch of liberals running around who are stupid enough to do things like this? Well, yes. Without a doubt. But what if it's not really liberals who are behind this? What if this is another of Karl Rove's schemes that he cooked up just to make liberals look bad? Hmmmmmmmm. Oh, you're not convinced? Well look at the intended targets. If you were Karl Rove and wanted to make liberals look bad while building sympathy for conservatives you would then have to decide which conservatives would be the targets of these pie-throwing, salad dressing-tossing goons. You probably wouldn't want to pick your friends. Instead you might pick out some conservatives who have annoyed you in the past. Pat Buchanan and William Kristol are both solid conservatives, but both have also been staunch critics of the Bush administration at various times in the past. Pat even ran against Bush's father - twice. And Kristol is constantly nitpicking Bush administration policies in his magazine. Definitely not team players and prime candidates for the pie-in-the-face role. If my theory is correct, then David Brooks had best watch out before he gets sprayed with a bottle of seltzer water at his next speaking event. I’m glad to see that some prominent Democrats are speaking out against the influx of legislation to expand legalized gambling in Texas. Rep. Jim Dunnam of Waco, chairman of the House Democrats, Rep. Garnet Coleman of Houston, chairman of the House Black caucus and Rep. Pete Gallego of Alpine, chairman of the Hispanic caucus, have denounced bills being pushed by fellow Democrats Sylvester Turner and Kino Flores as “the wrong solution at the wrong time”. Dunnam goes on to accuse the House Republican leadership of being behind the push for gambling expansion to cover up a $600 million hole in their school financing proposal but are using Turner and Flores to carry the measures so that their fingerprints won’t be on it. Gambling revenues, once a mere trickle, have become a critical stream of income in a number of states, in some cases surpassing traditional sources like the corporate income tax and helping states lower personal income or property taxes. The sums are so alluring that some officials are concerned that their states are becoming as addicted as problem gamblers. "We're drunk on gambling revenue," said Representative Wayne A. Smith, the Republican who is House majority leader in the Delaware Legislature. "Gambling revenues are like free money." It may seem like “free money,” but that is just an illusion. Gambling does not produce revenue, it simply soaks up existing revenue from other sources. Every dollar spent on gambling is a dollar that is not being spent in some other entertainment or consumer venue. And in some cases, people are literally taking food off of their tables to pay for their gambling habits. I saw an example of this first hand when I was living in Connecticut. I was standing in line to check out at a small neighborhood grocery store behind an elderly woman with a basket of basic food items - bread, meat, some canned goods, and so forth. When it was her turn to checkout, she noticed that she did not have enough money to pay for the groceries and get her daily allotment of lottery tickets. So she took the meat out of her basket and put it back! Needless to say, I was appalled. I’ve been absolutely opposed to state-sponsored gambling ever since. The role of the government should be to protect its citizens from these kinds of con games, not to promote and advertize them as a means to raise funds for basic services. The government should raise the revenue that it needs in a straightforward manner using a taxing system that is both fair and progressive. Instead, what we have are lawmakers looking for an easy out by sneaking revenues that at first don’t seem like a tax. But gambling is a tax even for those who don’t gamble. It taxes our communities by funneling away revenues that might otherwise have been spent at local restaurants or stores. It taxes families by adding financial strains that frequently result in broken homes and relationships. It puts a greater share of the tax burden onto the poor and ignorant who are then more likely to require government aid and assistance. This is one area where I find myself fully in agreement with the religious conservatives. Whenever I see a quote that seems really outrageous being attributed to some famous and/or controversial person, whether on the left or right, I am generally suspicious. In many cases the quote turns out to be wholly fabricated, misattributed or, at best, taken out of context. That was my thought when I recently saw the following quote being attributed to Margaret Sanger, the founder of Planned Parenthood. I saw this quote on a blog and was curious enough to Google it. What I found were dozens of anti-abortion web sites and blogs all attributing this inflammatory quote to Sanger and using it as justification to accuse her of being a racist, a Nazi and much worse things. This is quite disturbing since it is quite apparent to anyone with even a cursory knowledge of Sangerâ? ?s life and works that she would never have said anything of the sort. Planned Parenthood has a good summary of Sanger's life that refutes many of the malicious quotes that have been falsely attributed to her. But it is like a drop in the bucket compared to the flood of sites that are condemning Sanger with this kind of gross misinformation. 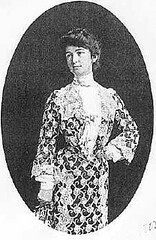 There are resources on the Web such as the Margaret Sanger Papers Project where anyone with an interest in knowing the truth can find the historical documents that relate to her life. I would challenge any of Sanger's critics to look at the historical record and try and verify a quote like the one above before spreading it around like a savory piece of malicious gossip. Just a while back I complained quite legitimately about the right-wing monopoly on local talk radio stations. A few days later came news that Clear Channel Communications was launching the first “progressive talk” station in San Antonio - KRPT 92.5FM. Then the very next week with less fanfare another talk station launched on AM1310 featuring even more left-leaning (or at least not right-leaning) folks such as the apolitical Sonny Melendez show, the moderate Eliza Sonneland and libertarian Carl Wiglesworth. Wow. That would mean there would almost be parity between the two sides in the local market. It will be interesting to see how long it lasts. Does Mark McGwire deserve a spot in the hallowed halls of the Baseball Hall of Fame? A few years ago the answer was positively yes. But now with the stain of steroids tainting so many ballplayers from what will now be known as the “juiced era,” it appears that McGwire could be left out. A recent survey of baseball writers who cast Hall of Fame ballots revealed that McGwire would indeed miss the mark if the vote were to be held today. Mark McGwire could miss out on making the Hall of Fame because of baseball's swirling steroids scandal, heightened by his refusal to answer specific questions before Congress, an Associated Press survey showed Thursday. I think this is unfair and I hope that in two years when McGwire becomes eligible for induction this will all have mostly blown over. McGwire should not be penalized after-the-fact for doing something that was not illegal at the time. The fact that steroids were not made illegal before 2002 is a failure on the part of the baseball owners and management and should not be used now to punish players who may have used steroids prior to that time. So barring Mark McGwire from the Hall of Fame for using steroids prior to 2002 would be like barring a pitcher who threw spitballs prior to 1920 when that practice was banned. And we know that a lot of pitchers who threw spitballs after 1920 are also in the Hall today. McGwire’s Hall of Fame predicament is nearly the opposite of Pete Rose’s. I strongly believe that Pete Rose deserves to be in the Hall of Fame and I’ve written about it here and here. What Pete Rose did was illegal (gambling), but it did not effect his playing career. What McGwire did (allegedly) was not illegal, but it most certainly would have impacted his playing career. Some people will now say with some legitimacy that this scandal should diminish McGwire’s accomplishment in breaking Roger Maris’ single-season homerun record. But baseball is an inexact science and there have been many changes over the years that make direct comparisons between generations of ballplayers difficult at best. Look at all the medical technology and advancements in personal fitness and training that ballplayers today take advantage of that was not available before. Today’s batters can watch videos of opposing pitchers and study them in depth before having to face them on the field. Then there is all the advancement in equipment over the years - better bats, balls, gloves; nicer stadiums with better lighting; better travel accomodations and, of course, lots better pay. Who is to say which of these, if any, has given today’s players an advantage over their historical counterparts? I think it is inevitable that baseball records will continue to fall whether the players are juiced or not. We should judge the players based on their talent on the field according to the rules of the game at the time they were playing. They should not be penalized for moral lapses off the field (Rose) or for failing to answer questions before Congress years after they have retired (McGwire).